"The Sony Cyber-shot DSC-HX100V is a feature-packed super-zoom camera, offering a 30x, 27-810mm zoom lens, 16.2 megapixel back-illuminated Exmor R CMOS sensor, built-in GPS tracking complete with a compass, full 1080p high-definition video recording with stereo sound and HDMI output and 3D Sweep Panoramas and 3D Still Images." The Sony HX100V is a good example of the current state of superzooms. 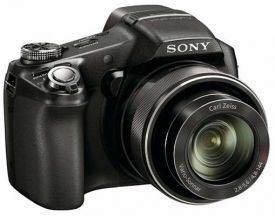 It is well-made, takes good photos, has huge amounts of zoom in a small package, and is not too expensive. I just wonder who will still buy them? This is probably what I call a refined end-game product; there is nothing much to go on beyond this without significantly breaking the mould. I just wish camera makers will hurry up and see the signs on the wall and do something about it already!